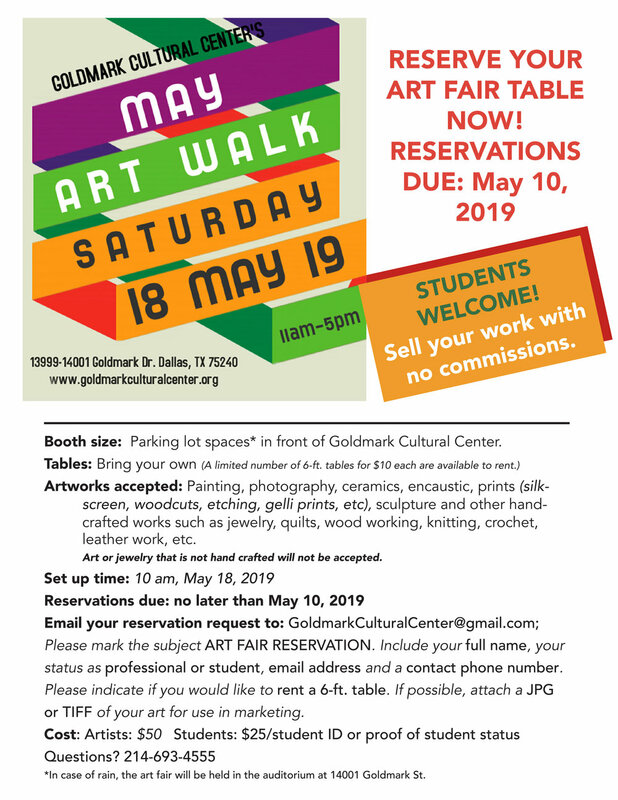 Join Goldmark Cultural Center Resident, Dallas Art Therapy, in creating a unique mural outside our Center. Everyone is welcome to help paint, design or just come watch! Every Saturday, from 10am to 2pm, weather permitting. Sponsored by the City of Dallas, Office of Cultural Affairs. Bring your brown bag lunch. Water will be provided. May Art Walk benefiting Dallas Arts Therapy! 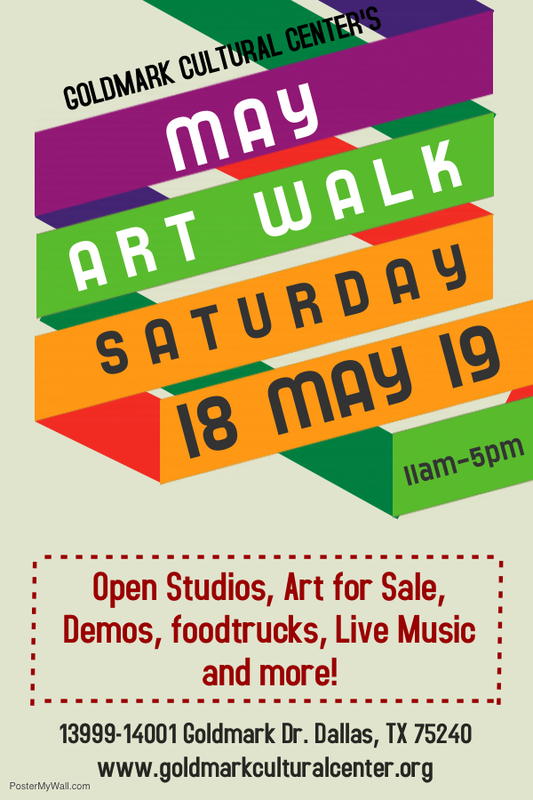 Join us for our next Art Walk, Saturday, May 18th benefiting Dallas Arts Therapy! Open Studios, Art for Sale, Demos, Food Trucks, Live Music and more! Art Fair Tables Available! Reserve your’s now! Reservations due May 10, 2019. Students Welcome! Details on how to register below. End of Summer Art Walk! Save the Date for our end of summer Art Walk! Save the date for our Fall Art Walk! Please bring your brown bag lunch. Join Goldmark Artist and Marketing for Artists consultant Andrea Lamarsaude and learn about the best ways to Market Your Art. •What is marketing and why is it so important? •Your situation as it relates to marketing your art. Plus we will have takeaways & helpful resources! Andrea is a Dallas-based visual artist specializing in abstract acrylic, mixed media and collage. Andrea’s hope is that her paintings tell captivating stories, inspire conversations, and bring positive, creative energy into the world. Andrea is a member of the Texas Visual Arts Association (TVAA) and is pursuing a Fine Arts Certification with Sessions College for Professional Design. She is Board President of Color Me Empowered and is a resident artist with Art for your Cause. She is represented by Swank Home | Morgen Garis Gallery at Dallas Market Center. Andrea is a native of Dallas with a bicultural French/American background with extensive marketing communications knowledge gained from working in a variety of settings, from startups to Fortune 500 companies, in the U.S., Europe, Africa, and Asia including Texas Instruments and Alcatel (Nokia). She has over 25 years marketing communications experience including: marketing campaign project management, trade show and event management and content creation (website, social media, web banners, print ads, billboards, newsletters, blogs, email marketing, printed collateral, articles, proposals, direct mail, advertising, etc.). Andrea holds a bachelor's degree in business administration, specializing in marketing, from Southern Methodist University, international management accreditation by INSEAD University, and professional certification, received via Alcatel's leadership training program, from the Ecole de Management Lyon in France. Andrea is a former Board President of the American Marketing Association, Dallas-Fort Worth chapter (2011-12). Bring your lunch and join us for our March Lunch & Learn! I love what I do, so it is what I do all the time, I am a Printmaker. In an era of mass produced imagery, I find great joy practicing the Old World techniques of Hand Printing. Something occurs during the physical act of creating a matrix with my hands, listening to the ink, feeling the paper between my fingers as I pull each print ; I become immersed in the process. Each technical challenge fuels the awe as I behold the final state of the print. I am witness to the magic that occurs when the abstract marks come together and an image becomes clear. This is the joy that is "Printmaking". With a BFA in Printmaking from Swain School of Design, experience as an assistant printer at Peregrine Press, and countless exhibits regionally, nationally, and internationally; I share my expertise through teaching and advising on many educational levels, I have worked with adults, children and professional artists to achieve a creative goal. Terri has created workshops and lectures for local colleges and high schools. Her work has been featured in numerous exhibitions, most recently at the Texas Women’s Museum. She owns Paper Arts, a local store featuring the largest selection in the country of fine arts papers from around the world. Please fill out and submit the form below to RSVP for our March Lunch & Learn. Thank you for registering for our March Brown Bag Lunch & Learn! Saturday, March 9th from 11:00 am - 5:00 pm! Artist Open Studios in both buildings! We’ll have our Pop Up Store, live artist demos and more! The Scouts will be on hand at our Art Walk selling Chocolate Bars for $1 and Scout Camp Cards. The money they raise from the chocolate and Camp Card sales will help with needed funds for Scout trips, uniforms, and other scouting needs. The money they raise from sales of these items will help with needed funds for Scout trips, uniforms, and other scouting needs. As well the Scouts will be "Scouting for Food." for the White Rock Center of Hope pantry. Look for our art decorated tubs in both buildings to place your donations. Food items most needed include: Canned foods such as meat products, chili, chicken, soup. Any boxed shelf item: for example, Hamburger Helper, Suddenly Salad, potatoes, etc. etc. CANNOT be opened or expired. White Rock Center of Hope serves all who come. It is a community coalition of churches, civic organizations, businesses, schools and individuals working together. Food Pantry Contributions provide groceries tailored to family size and needs and they also serve a wide range of Dallas areas with other services. February Brown Bag Lunch & Learn - Insurance for Artists. Our speaker is, Trent Wilkins - Agent with State Farm. Trent will focus on the specific insurance needs for artists. Trent Wilkins is a State Farm agent in Plano, Texas He focuses directly on small business owners and the difficulties that can arise from the day to day operations of running your own business. No matter how big or small it is important to know what you are at risk for and how to best cover your assets and liability of operating in the public sphere. Bring your brown bag lunch and come learn about this very important business topic for artists. The Goldmark Cultural Center will provide bottled water. This event is free but we do ask you to register so we know how many to expect. Please complete and submit the form below to register for this Lunch & Learn. Thank you for registering for the Goldmark Cultural Center February 12th Brown Bag Lunch and Learn - Insurance for Artists. Bring your lunch for this free event. The Goldmark will provide bottled water. Join us for the “Glazing, Bisque-fired Bowls” event for the 20th Annual North Texas Food Bank Empty Bowls fundraiser! We will be doing glaze painting on bisque bowls on Thursday, January 24th and Thursday, January 31st from 11:00 am - 2:00 pm each day. Goldmark Resident ceramic artists Marty Ray & Eva Kustarne will assist and give instructions. Final fired bowls will be donated to the North Texas Food Bank, March "Empty Bowls” Fundraiser. The “Glazing Bowls” event is free but we do ask that you complete and submit the RSVP form below so we know how many people to expect. Please print this screen for your RSVP. Thank you for RSVPing for the “Decoration of Bowls” event for the NTFB Empty Bowls event. You have RSVPed for Thursday, January 31st from 11:00 am - 2:00 pm. Bluebonnet Art Gallery and Framers will present their framing services. Location: Auditorium in 14001 Goldmark Building, January 26th at 2:00 pm. You have RSVPed for Thursday, January 24th from 11:00 am - 2:00 pm. Come and see our new space and learn about what we do! Meet the therapists and the board at this special event. Art For Your Cause recently moved to 14001 Goldmark Drive Suite 143 Dallas, TX 75240.. Proceeds from all sales benefit Shakespeare Dallas. Holiday Season - Pop Up Art Gallery! Visit our Holiday Season - Pop-Up Art Gallery in the Building 14001 Classroom through Friday, December 14th AND at our Resident Artist Holiday Sale on December 9th from 1-4pm! All works are available for purchase! During our November 17th Art Walk we invite you to come and listen to poet and artist, La Toya Ballard read selected works of her poems and see her poetry-related artwork. Ms. Ballard has a published work in Moon Book by Richard Ray. Location: Building 13999 of the Goldmark Cultural Center - Room #110. On Saturday Nov. 17th from noon-4 pm during the Goldmark Cultural Center Art Walk, Susan Sponsler-Carstarphen will be photographing anyone who wants to be included in The Hoodie Project. Participants will be photographed at 13999 Goldmark Drive, In Unit #100 wearing a hoodie in memory of Trayvon Martin and other victims of racial violence. The Hoodie Project is a memorial photo series instigated by the tragic murder of Trayvon Martin. It features artworks motivated by the iconic image of the “hoodie,” which Trayvon wore the night he was murdered, and its implications for race, representation and prejudice. The reference to the hoodie also highlights the popular dialogues that arouse surrounding the “hoodie” in popular culture, including the ways in which the garment has marked certain bodies as dangerous. Exhibit on display through November 9, 2018 in the John H. Milde Gallery at 13999 Goldmark Drive. An exhibition of works curated by Jacque Forsher. Available gallery viewing times - Monday - Friday: 11:00 am to 4:00 pm.